What’s Next for Vietnam-UK Relations in 2019? A recent foreign policy consultation put the focus on the opportunities and challenges for ties in the new year. Last week, Mark Field, the minister of state for Asia and the Pacific at the U.K.’s Foreign & Commonwealth Office, paid a visit to Vietnam. The interaction spotlighted the ongoing activity in the U.K.-Vietnam relationship and the opportunities and challenges that lie ahead for both sides into 2019 and beyond. As I have noted before in these pages, Vietnam and the United Kingdom upgraded their relationship to a strategic partnership back in 2010. The past few years have seen some additional boosts for ties due to the continuing strategic rationale for collaboration for both parties as Britain looks to boost ties with Southeast Asian states post-Brexit and Hanoi makes efforts to engage with a range of powers to deal with a host of economic and strategic issues. 2019 offers a mix of opportunities and challenges for the relationship. Both sides have signaled a desire to deepen collaboration on areas including education, trade, and investment, and the development of smart cities, and Vietnam’s desire to expand ties with regional and international actors is set to be in the spotlight even more with its membership in the UN Security Council and its chairmanship of ASEAN in 2020. But Britain’s continued management of its Brexit challenge, Vietnam’s lingering issues with human rights, and stresses to the rules-based international order also weigh heavily for both countries. Last week, U.K.-Vietnam relations were in the headlines again with the visit of Mark Field to Vietnam. Field was on the first leg of a wider trip that included both Vietnam and South Korea. His visit to Vietnam was his third visit to the country in about a year and tied to the convening of a deputy foreign minister-level political consultation between the two sides held on January 2. The consultation was co-chaired by Field and Vietnamese Permanent Deputy Foreign Minister Bui Thanh Son. Vietnamese state media reported that the talks covered a wide range of political, security, economic, and people-to-people issues, with both sides also discussing ways to enhance the relationship in areas including delegation exchanges, education, economics, combating wildlife trafficking and corruption, and collaboration at multilateral fora such as the United Nations. Apart from the consultation itself, Field’s visit also saw him undertake a series of engagements that covered Hanoi and Ho Chi Minh City and tied to the objective of advancing the strategic partnership between the two sides, with a series of focus issues including trade and investment, education, defense, and human rights. The British government noted that the interactions included meetings with Vietnamese officials, addresses on corporate governance and anti-corruption, consultations with representatives from civil society, and other interactions meant to emphasize aspects of economic and people-to-people ties such as a visit to a clothing factory for U.K. brands and a trip to a Vietnamese university that has joint degrees with a British university. The visit produced outcomes that both sides were keen to highlight, with examples including the signing of an agreement on smart cities in Ho Chi Minh City. But Field’s visit also saw some criticism about him not going far enough in addressing human rights considerations in spite of efforts by the U.K. to emphasize those as part of the wider agenda. Though part of this was tied to the timing of his visit, which came just as Vietnam’s cybersecurity law had come into effect, it also reflected the ongoing challenge that Britain and other external actors face when balancing efforts to advance ties with certain Asian states while also addressing democracy and human rights. A recent engagement highlighted ongoing activity in defense ties amid gains in recent years. 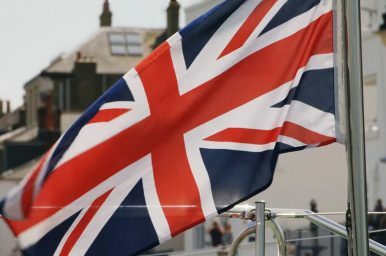 Warship Visit Spotlights UK-Brunei Military TiesWarship Visit Highlights UK-Vietnam Defense TiesA New British Military Base in Southeast Asia?Mark Field on Strengthening UK-ASEAN Relations Post-BrexitWhat’s in the New Vietnam-UK Defense Dialogue?